This paper considers the ramifications of post-auction competition on bidding behavior under different bid announcement policies. In equilibrium, the auctioneer’s announcement policy has two distinct effects. First, announcement entices players to signal information to their post-auction competitors through their bids. Second, announcement can lead to greater bidder participation in certain instances while limiting participation in others. Specifically, the participation effect works against the signalling effect, thus reducing the impact of signalling found in other papers. Revenue, efficiency, and surplus implications of various announcement policies are examined. Katzman, Brett E. and Matthew Rhodes-Kropf. (2008). 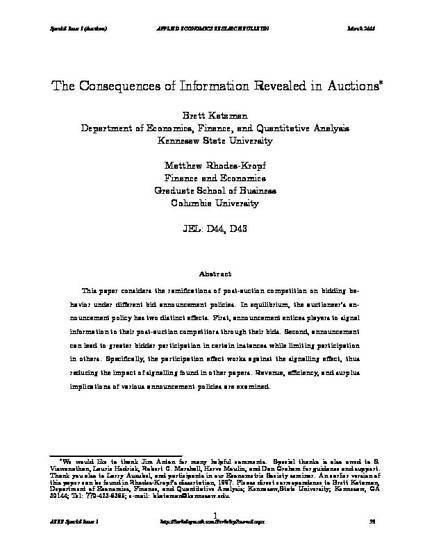 "The Consequences of Information Revealed in Auctions." Applied Economics Research Bulletin. Vol. 2, March 2008, 53-87.